Composition: 90% Viscose 10% Spandex. Smooth microfiber provides support and comfort exactly where needed. Pouch is seamed for support and definition. Short length boxer. The ErgoWear EW0812 X3D Modal Mini Boxer designed to fit like a second skin and actually adjust its fit over time to fit your body perfectly. This unique boxer brief has a leaner fit than a typical boxer brief for an even sleeker fit. The innovative microfiber fabric feels super soft against your skin and is designed to wick away moisture on contact, keeping you dry and cool all the time. 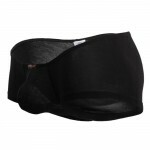 The 3-dimensional pouch is ergonomically shaped to provide amazing comfort with plenty of room.